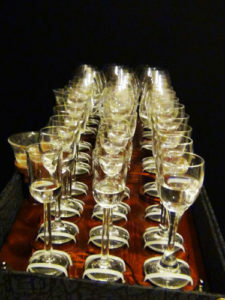 The first step to make a glass harp is to find all the required glasses, but before starting the search there are some things to know. First of all the glasses must have a stem, this allows the upper glass bowl to resonate when rubbed. The stems should not be too thin or long, specially for the low notes. Thin stems can break easily and sometimes are too flexible to support the oscillations of the cup above. For the low notes cognac glasses work very well because the stems are usually short and thick. Each glass will have an assigned note, the instrument should have at least 25 notes tuned in chromatic scale. 25 half tones cover a range of two octaves, if you can find more glasses the wider range will surely give better possibilities. The glasses will be tuned to the desired pitch by adding water. This will make the pitch go down, therefore every empty glass should have a pitch that’s higher or equal to the assigned note. Water also contributes to sound damping so if little water is required for tuning the sound will be brighter. For best results the pitch should not be dropped more than 1 tone. Keeping these simple facts in mind, all you need now is a chromatic musical instrument tuner to determine which musical note any glass is suitable for. When choosing the glasses try to find the ones with sweet tones, even if all identical some will sound better than others. Once the set of musical glasses is complete its time to choose the note layout. The most commonly used is the piano keyboard layout. Most musicians are familiar with it and has been adopted by many glass players. Another good choice is button accordion layout, it keeps the glasses closer and reduces the instrument’s dimensions. The glasses must be firmly attached to a board in the desired position so they can be played without falling over or touching each other. The glasses should also stand upon specially made steps so all the rims are at the same hight, this will make playing easier. Both board and steps can be easily made with plywood. 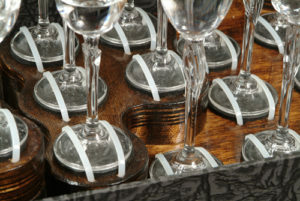 An easy way to fasten the glasses to the board is using two zip ties around the bottom part of each glass.